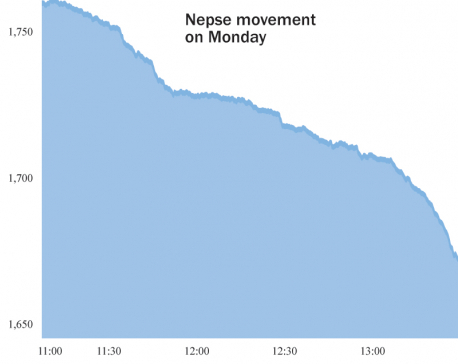 KATHMANDU, March 25: Nepal Stock Exchange (Nepse) benchmark index plunged 58.52 points this week to close at 1,220.44 points on Thursday, the last trading day of the week. 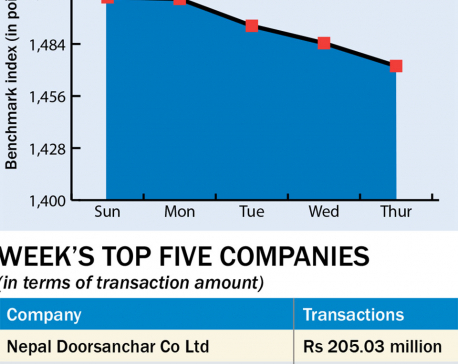 The market rout continued last week as bank and financial institutions (BFIs) were scrambling to attract depositors with various schemes, indicating that the shortage of lendable fund was likely to worsen. Higher interest rates of BFIs have only sent jitters among investors, and many of them are selling their stocks in the bearish market as those who have borrowed to invest on stocks are now likely to get margin calls from BFIs. "There is a kind of panic in the market that the stocks will fall further. So, many have now opted to sell their shares so that they do not have to suffer further losses in the days to come," said a stock broker. "However, there is a tight bargaining going on between buyers and sellers on the price of stocks," the broker added. There has not been any statement from the newly appointed Minister for Finance Yuba Raj Khatiwada about the stock slump, making investors more afraid about the possible restriction in the rise of stocks in the days to come, say analysts. Though the stocks were recovering after a huge fall following the announcement of communist alliance and the victory of the alliance in the recent polls, the appointment of Khatiwada and his statement in an interview implying that stock market was an unproductive sector sent stocks to a downward trend. Except the Trading group which went up 1.36 points to close at 209.79 points, all groups ended in the red zone. Insurance was the highest loser of the week as its sub-index dived 509.89 points and ended at 5,684.47 points. Sub-indices of Microfinance and Hotels groups plunged 98.48 points and 97.25 points, respectively, settling at 1,359.35 points and 1,752.24 points. Hydropower group fell 90.57 points to settle at 1,442.99 points. Banking, the heavyweight group, also ended 44.71 points lower at 1,091.89 points. Sub-indices of Development Bank and 'Others' groups went down 48.67 points and 18.69 points, respectively, ending at 1,446.46 points and 692.76 points. Finance group also registered a loss of 18.21 points and ended at 646.47 points. Manufacturing and processing group lost 16.35 points to settle at 2,184.23 points. A total of 4.6 million units of shares of 173 companies worth Rs 1.72 billion were traded in the market this week through 23,869 transactions. The turnover was 32.99 percent higher than the last week. 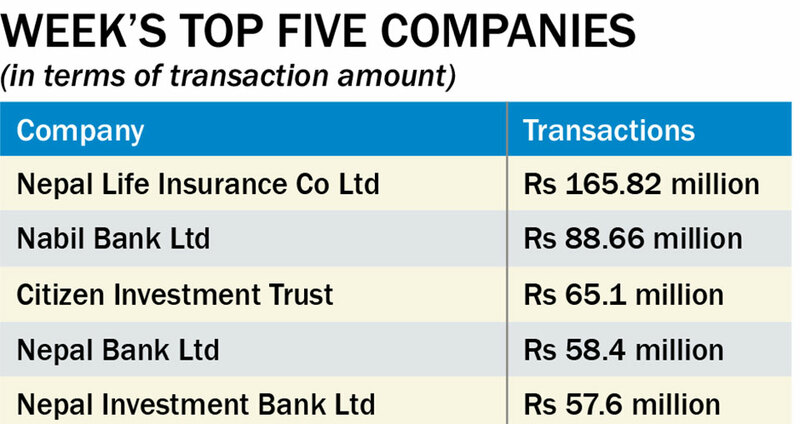 Nepal Life Insurance Company Ltd remained at the top of listed companies in terms of highest turnover (Rs 165.82 million) and number of transactions (1,887). It was the NCC Bank that became top in terms of number of traded shares (214,000 units).